Some trees have shallow roots that rise up over time. An example is this maple tree to the left. 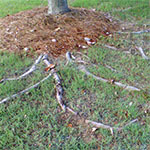 These exposed tree roots can be a major annoyance when they are in your lawn area. They are difficult to mow over or even walk over. How can you treat these areas? You don’t want to cut out the tree roots because the resulting root damage can permanently damage or kill the tree. You have two choices. You can remove the grass in a 4-6 foot circle around the tree and plant a ground cover or coat over with a layer of bark dust. You could also conceal tree roots by adding 2-3 inches of soil to fill over the roots and then sod over this leveled ground. When sodding over tree roots, be sure to compact the soil well before laying the sod. Water the freshly installed sod and keep moist for about 2 weeks allowing it to take root. For the best sod, go to your local sod farm. 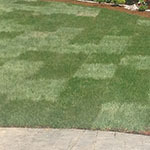 Can You Lay Sod Over Existing Grass? I have heard of people doing this… but it is not a good idea. It may seem like an easy solution, but here are the problems you create. Unlevel lawn: You want a firm, level surface to lay your new sod over. It may start out level, but as the old grass breaks down it will turn out very uneven. Weeds: Your old grass is not dead and it will work to grow up through your sod and produce a weedy looking lawn. Harder to root: You want your sod to root very quickly. You want to place it against firm level ground and give it the shortest possible distance for the roots to grow. By laying the sod over an existing lawn, the roots have a much longer distance they need to grow. If you want a top quality job, you can’t take the easy short-cut. 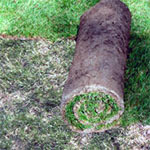 Take up the old sod and rototil your soil and prepare it correctly. More on installing sod.